My research is driven by the underlying goal to advance our understanding of fundamental geodynamic processes, such as volcanism, mountain building, continental rifting, and craton formation. 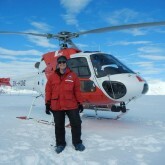 To this end, I employ a wide range of geological and geophysical tools emphasizing earthquake seismology, active tectonics, and the analysis of seismic data to investigate structure and to infer associated Earth processes. 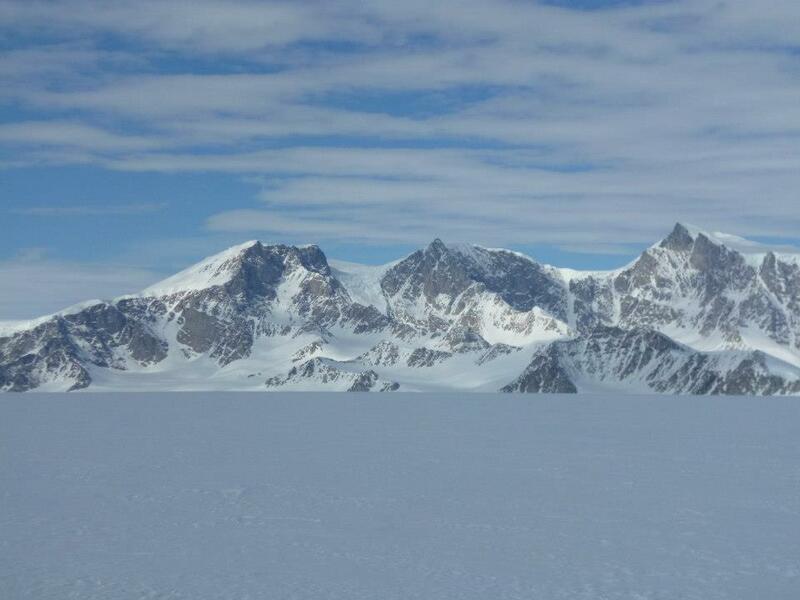 Past and current research projects have focused on a variety of different geographic locations including Hawaii, Costa Rica, Saudi Arabia, Africa, Greece, and Antarctica. Current constraints on the crustal thickness and seismic velocity structure beneath the Transantarctic Mountains (TAMs) and the Wilkes Subglacial Basin (WSB) are limited, leading to uncertainties over competing geologic models that have been suggested to explain their formation. 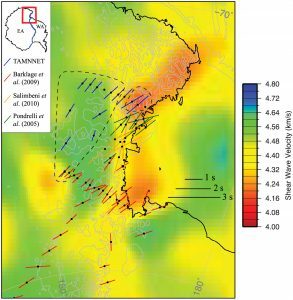 To broaden the investigation of this region, I operated a 15-station array across the northern TAMs and the WSB between 2012-2015, which filled a major gap in seismic coverage. 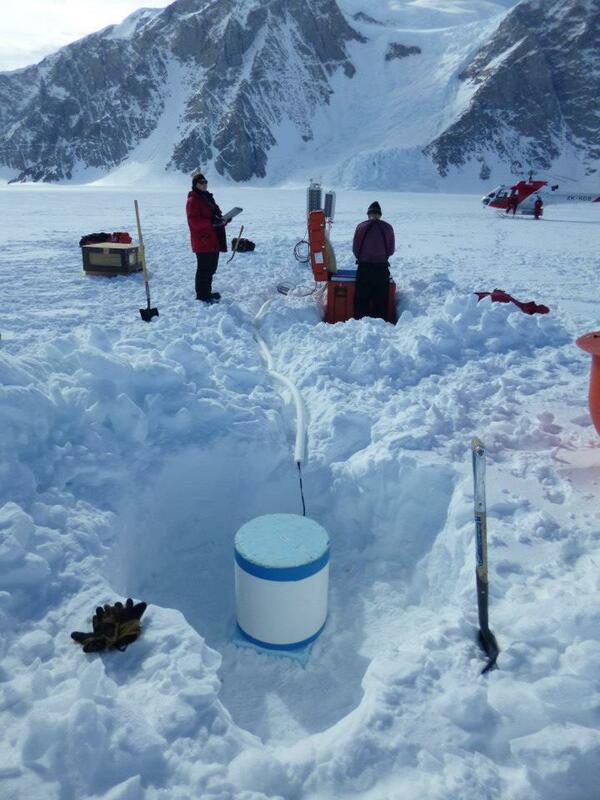 Data from TAMNNET is being combined with that from other previous and ongoing seismic initiatives and is being analyzed with a variety of techniques to generate unprecedented images of the subsurface structure beneath this area. 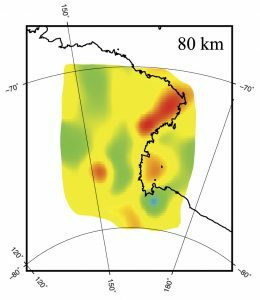 Results from this work are being used to differentiate between competing tectonic models, thereby resolving how the TAMs and WSB originated and how their formation relates to Antarctica’s geologic history. 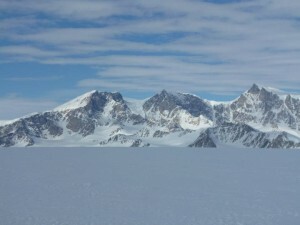 (left) Transantarctic Mountains. (right) Installing a TAMNNET seismic station. (left) Map view image of shear-wave velocity structure at 80 km depth beneath the central and northern TAMs from Graw et al. (2016). 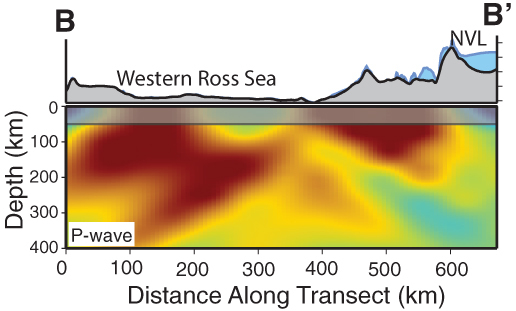 (middle) Cross-sectional image of compressional wave velocity structure along the TAMs front from Brenn et al. (2017). (right) Shear-wave splitting results from Graw and Hansen (2017). 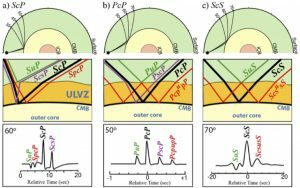 Ultralow velocity zones (ULVZs) are thin, laterally-varying boundary layers seen in some locations just above the Earth’s core-mantle boundary (CMB). They are associated with dramatic seismic wave velocity reductions and increased density, but their highly variable structure and distributed locations have lead to many questions regarding their origin. 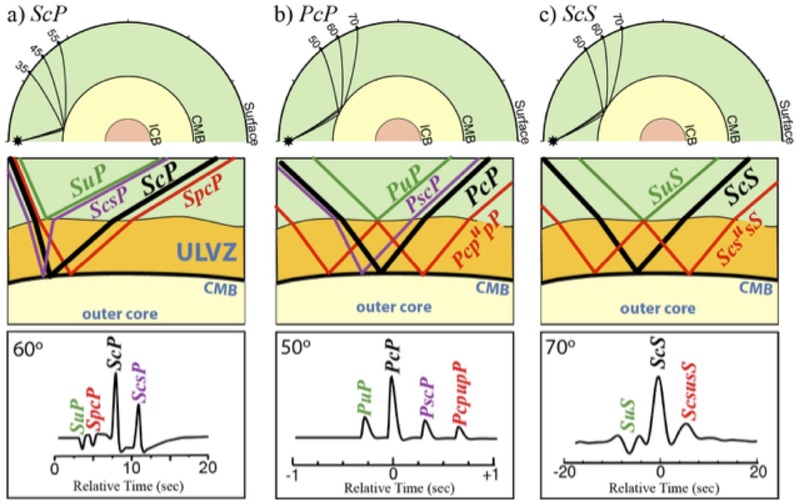 Incomplete sampling of the lowermost mantle has limited our ability to map global ULVZ structure in detail; therefore, investigations that sample the CMB with new geometries are crucial to further our understanding of ULVZs and their possible connection to other deep Earth structures and processes. The TAMNNET deployment (see above) provides a unique dataset to investigate previously unexplored sections of the CMB. Working with Dr. Ed Garnero at Arizona State University, we are analyzing core-reflected phases to identify anomalous CMB structure beneath the southern hemisphere. Core-reflected phases (ScP, PcP, and ScS) and their principle associated arrivals from a ULVZ at the CMB. Provided by Ed Garnero (ASU). 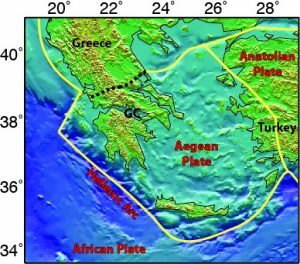 The Hellenic subduction zone (HSZ) is the most seismically active region in Europe and plays a major role in the active tectonics of the eastern Mediterranean. 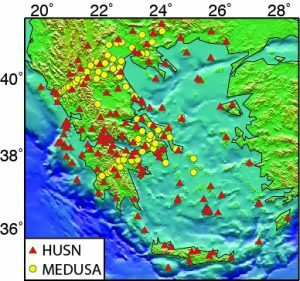 This complicated environment has the potential to generate both large magnitude (M > 8) earthquakes and tsunamis, and situated above the western end of the HSZ, Greece faces a high risk from these geologic hazards. Despite previous investigations, the kinematics of the HSZ are still controversial, and high-resolution images of the HSZ seismic structure are needed to delineate important characteristics influencing the seismic and tsunami potential in this area. Working with colleagues at the National Observatory of Athens (NOA), I will be developing new tomographic models for the HSZ, which will be used to inform NOA hazard assessment that will ultimately impact the broader Greek community living in this dynamic geologic environment. (left) Map of study area with geographic locations labeled in black and geologic features labeled in red. Yellow lines mark plate boundaries. Black dashed line: Central Hellenic Shear Zone. GC: Gulf of Corinth. 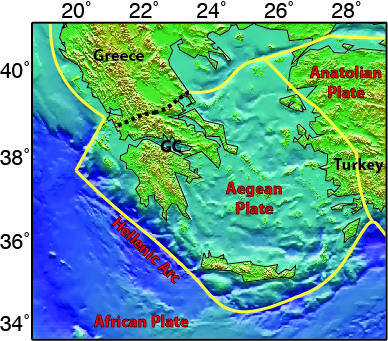 (right) Map highlighting seismic stations throughout Greece that will be used for this study. 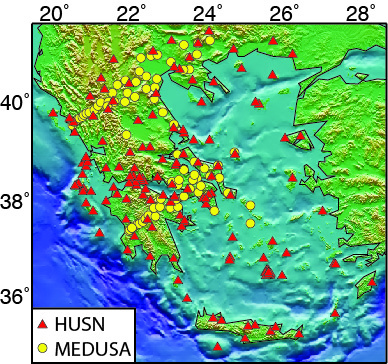 HUSN: Hellenic Unified Seismological Network, MEDUSA: Multidisciplinary Experiments for Dynamic Understanding of Subduction under the Aegean Sea.